Suad, her husband Mamdoh, and their four children, Tabarak, 12, Ali, 11, Assal, 10, and Yuseef, 6, have only been in Canada for four months, but they’re working hard to make a life for themselves in Cambridge, Ont., having arrived in this country through Mennonite Central Committee (MCC) Ontario’s refugee sponsorship program and the efforts of Wanner, Breslau and Preston Mennonite churches in southern Ontario. The Saidams are quick to express their gratefulness and joy at their new lives in Canada, frequently punctuating their narratives with el-Hamdallah (“Praise be to God”). Translator Noha Abdul Ghaffar explains that the name of their refugee camp on the Iraq/Syria border, Al Hol, translates roughly as “the nightmare.” The family spent five years there after fleeing their native Iraq, when violence erupted between Sunni and Shi’a Muslims. The whole family witnessed scenes of torture, and Suad’s cousin was killed because he was Sunni. When a classmate of Tabarak’s was kidnapped and murdered because she, too, was Sunni, the Saidams decided they had had enough. The family first tried to escape into Jordan, but they had no citizenship. Although both Suad and Mamdoh were born and raised in Iraq, as were their parents before them, their grandparents came to Iraq from Palestine, which made their entire family ineligible for citizenship. Jordan, not wanting to encourage Palestinian refugees, would not accept them. The family, along with several other Iraqi Palestinians, could do nothing but literally sit in the desert for two months with almost no resources. Mamdoh explains that for the first two days they had no food or water, and they were worried about their children. The men built a circle with suitcases and used their coats as a roof to provide some protection from the heat for the women and children. Finally, the United Nations brought rations, and eventually moved them to Al Hol. With neither Iraq nor Syria willing to claim them, Palestinian Iraqi refugees are stranded on an isolated stretch of desert. This isolation had devastating effects for the Saidams, who lost a newborn daughter, Gazal, when they didn’t have access to a hospital. Despite their troubles, Mamdoh says his greatest joy in Canada is how bright the future looks for his children. Suad agrees, and mentions the joy she finds in the people who have helped them. While they sat together, the family and their sponsors got acquainted. As it turned out, Antonio had become good friends with MCC workers in the refugee camp in El Salvador, where they lived for most of the 1980s. These MCC workers had suggested they find a Mennonite church to attend once they arrived in Canada. They were very moved that, of all the sponsors and new arrivals in this group, they had been matched with the only Mennonite church involved. “No, surely this was the work of God,” she quickly adds. Like most new Canadians, the Avalos family struggled with language. This provided a memorable time for Dyck, when Marina went into labour in the middle of the night. Dyck rushed to the house of their translator to take her to the hospital, but couldn’t get a response with the doorbell or by knocking. She ended up climbing through the bushes to pound on the windows and yelled until she succeeded. Over the past 20 years, the Avalos family has remained closely connected with Kitchener MB, and continues to express its deep appreciation to MCC and the congregation for all of their support. This has included the birth of a fifth child, and the arrival of Antonio’s oldest daughter, who he had believed was dead. Family reunions are one of the greatest joys of the MCC private sponsorship program. 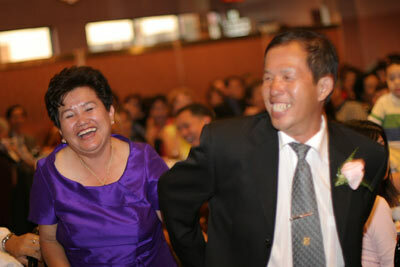 Fleeing the Khmer Rouge, Lo Chiang Cheng’s family came to Canada from Cambodia in 1979, when she was seven years old. The family—including her parents Tak Chhing Cheng and Khantry Chin, and two younger sisters, Lo Mey, 3, and Lo Sing, 1—were soon joined by Tak Chhing’s uncle and his family, reuniting cousins that had grown up together as siblings. After that, Tak Chhing’s sisters and brothers were sponsored in Ottawa, so the Chengs moved from Orillia, Ont., to be near them. Coming as a child, Lo Chiang is the embodiment of new arrival Mamdoh’s hopes for his children. With a master of business administration degree from Queen’s University, Kingston, Ont., Lo Chiang works in management for the federal government. “My parents viewed this as a second chance, and drilled it into us to work hard, so we would never have to start from scratch again,” Lo Chiang says. Both parents led by example, with Tak Chhing eventually opening his own construction company. Like Yuseef, the youngest member of the Saidam family, Lo Chiang was too young to remember her life in Cambodia before the Buriram Refugee Camp in Thailand, where her family spent two years. She remembers the challenges of life in the camp, though, particularly never having enough food. When some local kids started bullying Lo Chiang and Lo Mey, the church immediately stepped in. “One of the sponsors’ daughters started walking us to school and [the church] talked to the teachers,” she says. It was people such as the Chengs that brought the MCC sponsorship program into being in the first place. In the 1970s, images of the humanitarian crisis in Southeast Asia prompted an outcry that resulted in the sponsorship of hundreds of thousands of refugees to Europe, Australia and North America. In Canada, MCC signed an agreement with the federal government constituting the first ever Private Sponsorship of Refugees Program. To this day, Canada is the only country in the world that allows private sponsorships. Churches, individuals and even small businesses have responded by the thousands, sponsoring more than 50,000 refugees through MCC to date. With a number that large, it is important to remember that every one of these “refugees” is a person who has a life beyond their traumatic ordeals. They have their own hopes, dreams and memories, and each has a story to tell. People often forget how much these new Canadians enrich and contribute to this country. That’s why MCC Ontario is seeking to re-connect with former refugees who have come through its sponsorship program, believing that having former refugees become more involved in the work of MCC Ontario will provide invaluable new insight for its programs, particularly the sponsorship program. Reflecting on her involvement with the Avalos family, Dyck explains that her interest in sponsorship is the result of her own experience, having come to Canada from Russia with her mother in the 1920s, when she was five. This was at the same time that MCC was founded as a response to Mennonites in Russia and Ukraine who were suffering from persecution and famine. While most of MCC’s work at the time involved material aid, it also helped settle thousands of these people in Canada and the U.S.
Seventy years later, Dyck “paid it forward,” as her church helped to sponsor a family that came through the MCC private sponsorship program that came into being as a result of people like Lo Chiang Cheng and her family. For more information, or to become involved, e-mail our.stories@mennonitecc.on.ca or call toll-free 1-800-313-6226. Dear brothers and sisters. With deep sorrow, I learned about my aunt's death JOHANNA DYCK. For Christians there is no death. But I understand how hard the loss is for my cousins. For me, this is also a great loss. 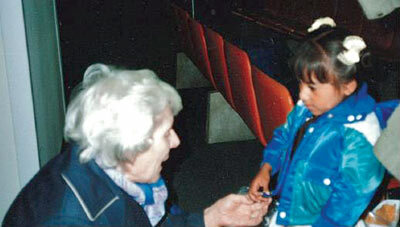 My aunt put all her strength for my spiritual education together with my grandmother Katarina Ediger in 1991. It was to them and to Aunt Liza Schultz that I became a real Christian. It was a time of heated debate between me and my aunts, and the victory of Jesus Christ over my atheistic mind. Unfortunately, for 20 years now I can not come to Canada. After the death of my grandmother, I could not get invitation to enter Canada to visit my relatives and close friends. I really miss Brian Wings and Jeff Klassen. In the days of my stay, they put a lot of energy into my spiritual education. Bryan was a real brother to me and gave me a very expensive present for the last money. All these years I would like to thank these people. But, if I can not, let the Lord reward them for their kind hearts. May there be always joy and peace in their families. The peace and grace of our Lord Jesus Christ to all my brothers and sisters, my cousins. With love.